U.S. Secretary of Education Betsy DeVos - earning a National Blue Ribbon distinction. Roberts is one of 342 schools in the nation and one of 3 schools from Arkansas to be recognized in 2017. The "National Blue Ribbon Schools" program recognizes schools in two areas of performance: "Exemplary High Performing" - recognized among their state's highest performing schools, measured by state assessments for nationally-normed tests; and "Exemplary Improving" - at least 40% of the schools' disadvantaged students demonstrate the most progress in improving achievement levels, measured by state assessments or nationally-normed tests. Top education officials from each state nominate schools for this distinction. This coveted recognition has been bestowed on nearly 9,000 of the nation's schools since the program's inception 30-years ago. Representatives from Roberts will travel to Washington DC to be recognized during an awards ceremony in early November. Ceremonial events and activities begin the afternoon of Monday, November 6 and culminate in the awards lunch and presentation on Tuesday, November 7. Decked in blue clothing, students were only told that they would be participating in a special assembly today. The surprise video announcement by Secretary DeVos left them roaring with excitement. Following the announcement, students were treated to "blue" snow cones. begins Monday, September 18 and ends Thursday, October 5. VISIT www.LRSD.org/CPD FOR ONLINE REGISTRATION AND PAYMENT DETAILS. Central East Cluster Team "Kickoff to a Successful School Year" is Saturday, September 9th, 2017 at Stephens Elementary, 3700 West 18th Street 10:00 a.m.-12:00 p.m.
Catch mini-seminars and get your DOOR PRIZE ticket stamped. Participants must attend at least three (3) seminars to be eligible for the GRAND prize drawing. WillSub is Hiring Subsitute Positions! Read more about WillSub is Hiring Subsitute Positions! This is to advise you that we have been informed by the state that the Home Access Center (HAC) is now available for you to review your student's online records. You should have received a letter in the mail that included your login and password. If you did not receive a letter, please contract your child's school on Tuesday. The 43rd Annual College Night will be held Tuesday, September 26, 2017 from 6:00 PM to 8:00 PM at the Metroplex Event Center located at IHeart Media (10800 Colonel Glen Road). Representatives from colleges, universities, technical schools, military and financial institutions throughout the country will be in attendance. All High school students and parents are welcome to attend. Financial aid information will be available. 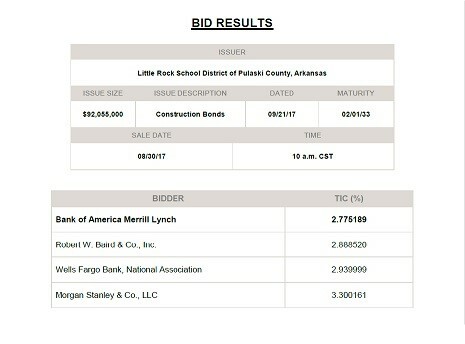 The Little Rock School District, in conjunction with Stephens, Inc. and the RSI Group, LLC as co-municipal advisors, announced Wednesday that Bank of America Merrill Lynch was awarded the bid for the sale of second-lien bonds to fund $90 million in capital improvement projects. Please be advised that due to the Razorback game, there could be some delays in traffic, including school bus routes. The following advisory has been issued by authorities. Arkansas State Troopers are preparing to meet the traffic challenges of a weekday Razorback football game at War Memorial Stadium located in central Little Rock this week. The Jefferson Open House scheduled for September 7th has been rescheduled for September 26th. LITTLE ROCK — Fourteen outstanding teachers have been named 2018 Arkansas Teacher of the Year Regional Finalists. Gov. Asa Hutchinson and Arkansas Department of Education Commissioner Johnny Key will recognize the regional finalists at 10 a.m. Aug. 30, 2017, in the Old Supreme Court room at the Capitol. During the ceremony, the four state semi-finalists will be announced.